VikingOracle is a personality known in our discussion forums for providing insightful information. Join the discussion today to find him and other knowledgable VikeFans. Defense Vanillaness: Does it feel to you that the Vikings are still holding some of their defensive packages/blitzes in their back pocket? Through two games, I am not sure I have seen a single double a gap blitz. I am wondering whether Zimmer is being more judicious in his use of blitz in order to save some for later in the year. Speed: Both defenses impressed me with their speed. The Steelers couldn’t get anything to the edge. Penalty Diagnostics: I would assume some team/media company/diagnostics site has calculate how much a penalty (either by the defense or offense) affects the chance of success or failure for a given drive. I think this game would be a perfect example how a single penalty on a drive will have a great impact on the success of the drive. This is especially true when you are playing a backup at QB — one holding penalty must reduce the success rate hugely; alternatively, one pass interference (or off sides on 4th down), greatly improves the success rate. 3rd or 4th down defensive penalties are probably the single most detrimental penalties in the game. I am sure someone has calculated this (since they have a running likelihood of winning state running in real time on ESPN) and I wish they would show this to the Vikings. I think Easton killed a couple of drives by himself. Officiating: I thought it was a really poorly officiated game. Take for example the two reviews of possible catches along the sidelines. As I watched the Steelers’ catch, I saw no telltale signs of the foot actually dragging in bounds. On artificial turf you will see the rubber balls pop-up and on natural grass you should be able to see the drag line in the grass. I saw neither (though I assume it was natural turf). Now compare it to Diggs. Without looking at whether he had control while in bounds, if you watch and look, you can see the drag line of his foot in the turf. Likewise, I don’t know how you overturn Cooks TD if you don’t have a camera positioned directly down the line (maybe the NFL has that and we don’t get to see it). Otherwise, you need to do some fancy math to determine that the on field crew was incorrect. Finally, on the fake punt, that was pass interference, the defensive back clearly had his arm around the receiver’s back. Age v. Athleticism: According to PFF, 3 of the top rated Steelers were Olinemen: Gilbert (T), Foster (G) and DeCastro (G). Now, Griffen was a beast and I thought Joseph played well (I am always impressed by how well he pursues plays away from himself). However, I think Robison and Tom Johnson (3 tackles and no quarterback hits between them on 101 snaps collectively — Stephens had 3 tackles on 35 defensive snaps) made the interior of the Steelers line look great. 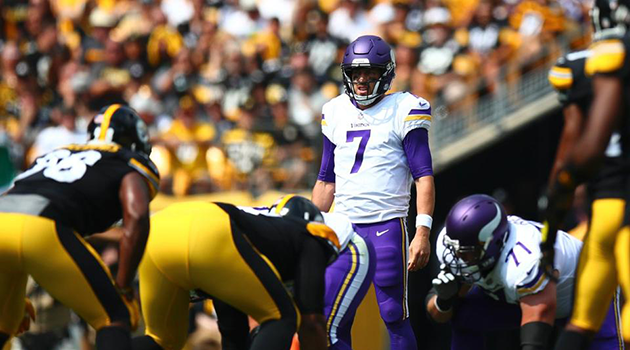 Now, perhaps Johnson and Robison are fulfilling their duties better than some younger players on the roster but Robison certainly didn’t show his wily ol’ veteran savvy on that 4th down play. I think you are going to hear more and more fans calling for Jaleel Johnson to get some play. Frankly, I wonder whether players who are clearly on their last season are going to play with the abandon of a young buck — or whether the whole concussion thought may affect their play. If Johnson and Robison are not bringing veteran savvy to the field, maybe it is time to go younger. Steelers Response: One thing I thought I noticed was the Steelers shortened their huddles part way through the second quarter (correct me if I am wrong). Roethlisberger still used most of his allotted time but used it at the line of scrimmage to read the defense and audible out of plays. It was almost Peyton Manning-ish. Maybe this proves my point about to be invalid but I thought it was interesting and I wonder whether, give this, the Vikes were showing their true plan (zone v. man2man, etc.) too early in the play clock. I thought it was a smart change by the Steelers and allowed them to get into better plays more often. Forbath: Really? Wouldn’t you practice your PA everyday of the week until you can do them in your sleep? Vikings PEE (Player Exceeding Expectations): Rhodes. I know this is a strange choice but I think it is because of the telecast — usually they don’t focus on Rhodes because the QB is always throwing elsewhere but because of the match up, they covered him a lot on TV. It also is startling seeing him cover a received as compared to Waynes. My respect for Rhodes grew a lot today (and it still looked like he was hampered a little by his injury).